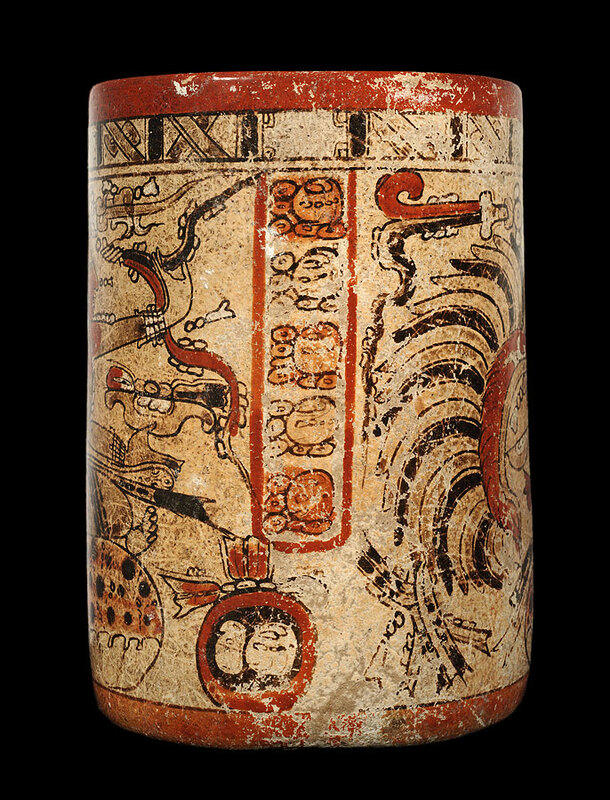 This incredible Maya ceramic cylinder is painted with bold red and precise black brushstrokes against cream colored slip. The red band on both the top and bottom of the cylinder creates the traditional frame for such painted cylinders. A series of rectangles with repeating motifs complete the upper border. The deity Hun Hunahpu, father of the Hero Twins of the Popol Vuh, is the focus of this piece. 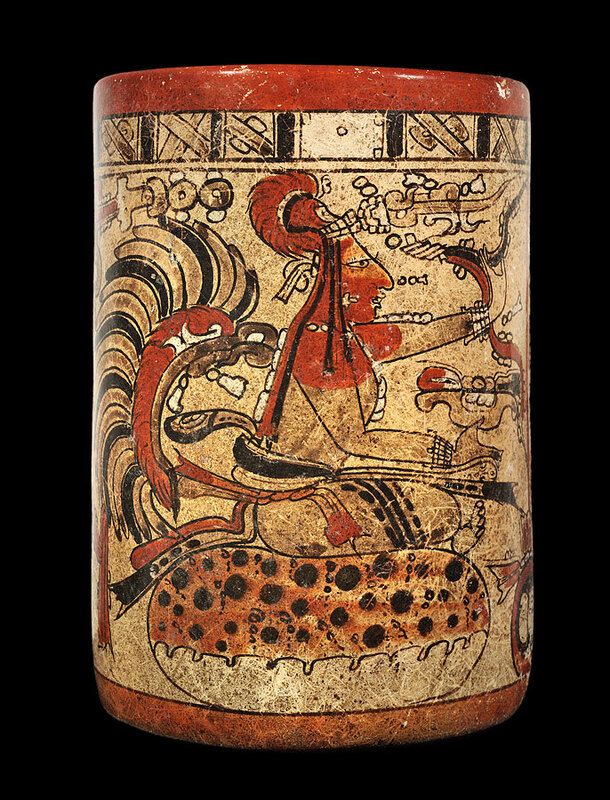 Also known as the young corn god or tonsured corn god, Hun Hunahpu sits upon a cushion made of jaguar skin. His upper body is adorned with paints and ornamentation in the manner of lords; he is represented twice on this vase. Beaded bracelets bedeck his wrists, ear flares are set into his lobes, and a jade necklace falls from his neck. A large belt with multiple layers is wrapped around his waist. In one hand the maize god holds a palette such as those associated with scribes, appropriate due to the young corn god’s affiliation to scribes and the arts. The palette holds three dots representing the palette’s inkwells; these are naturally formed within the conch shells used by artisans for their work. With his other hand Hun Hunahpu gestures toward the ornate maize spiral that arises from his forehead. To separate the two depictions of the young corn god the artist painted identical glyphs in two columns; six on one side and five on the other. A wash overlays these in alternating red and dark grey wash, likely a diluted form of the black used in the fine line painting aspects of the vase. A red border separates these glyphs from the rest of the image. Beneath the six glyph columns a round border surrounds a single glyph while beneath the group of five another round border encloses a pair of glyphs. Atop these are identical rods with decorative fans at the center and at the end closest to the god’s cushion. The vase has been burnished and smoothed to a fine polish, one that protects the masterfully painted cylinder and seals the earthen medium to make it both leak proof and resistant to weathering. 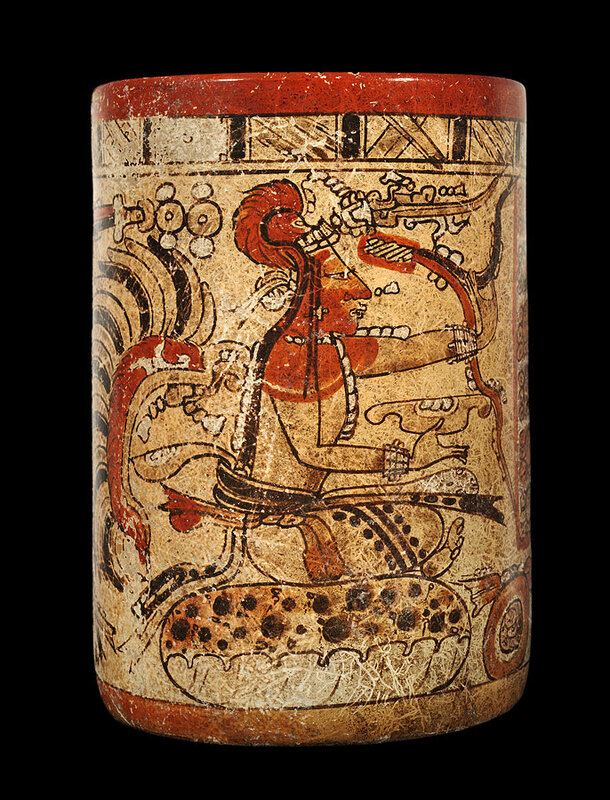 This vessel type was once used by Mayan priests and lords for the drinking of xocōlātl, a drink made from cocoa beans, cornmeal, vanilla, and chili pepper among other ingredients. These were ground and mixed with water, then poured from one vessel to another and back several times from standing height until a frothy beverage was prepared. 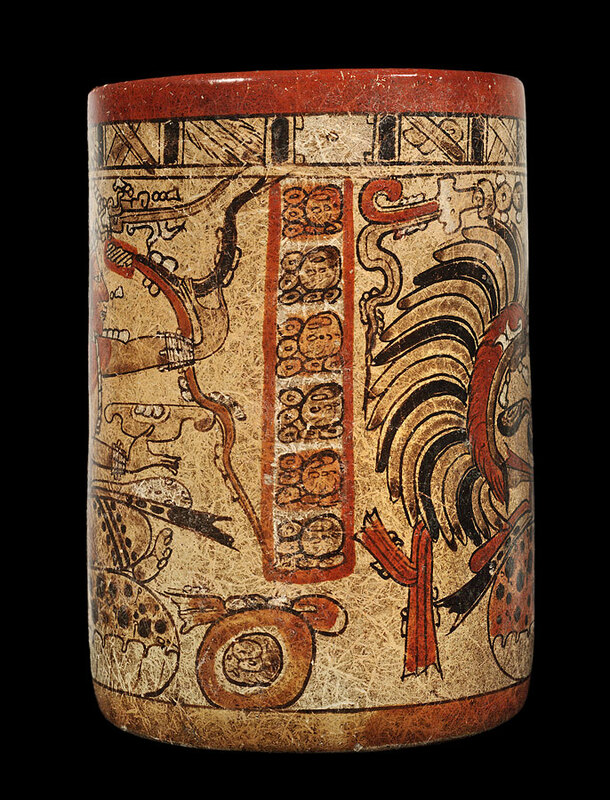 Truly this cylinder was worthy of being used by the Maya elite.